Sauteed red peppers add a savory flair to this quick and easy snack. Coarsely chop bell peppers. Heat olive oil in a large skillet. Add peppers and garlic; cook over medium heat for about 15 minutes or until peppers are softened, stirring occasionally. Remove from heat and let cool slightly. Place in blender or food processor and puree until smooth; stir in vinegar, basil, salt and pepper. Cook asparagus spears in boiling salted water for 4 to 5 minutes until crisp-tender; drain. 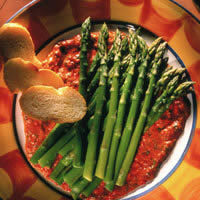 Spoon red pepper sauce on a platter and arrange asparagus over sauce. Garnish with bell pepper, basil and Parmesan, if desired.